The stadium was opened in the year 1947. In 1984, it was reconstructed for the 1984 Winter Olympics, and is therefore often called Olympic Stadium (Olimpijski stadion / Олимпијски стадион). Since July 2004, FK Sarajevo proposed the new name for sporting and football events, in honor to its former player and club's legend from the 1960s, Asim Ferhatović - Hase. Today, total capacity of Stadium Koševo is 37,500 seat, and up to 70,000 for musical and various public events, such as U2's PopMart Tour in 1997 and Dino Merlin's Burek tour in 2004 and Hotel Nacional in 2015, or hosting of papal pastoral visitations by Pope John Paul II two days visit between 12–13 April 1997 and Pope Francis in 6 June 2015. It is also the home stadium of the national football side of Bosnia and Herzegovina. Construction works started in 1947. The stadium was literally buried into a local hill thus merging with its natural surroundings. In 1950 a pitch and a tartan track were also added. The first international football match, between Yugoslavia and Turkey, was played in 1954. In 1966, the stadium hosted an athletic championship for the Balkans. It was renovated for that occasion. New administration building was built, so were the new locker rooms and a restaurant. A modern scoreboard and new lighting were also provided. 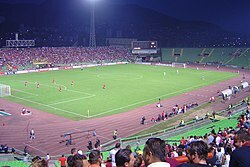 The stadium was renovated for the third time after the Bosnian War, in 1998. By adding the chairs on every stand the seating capacity of the stadium was reduced to 37,500. Throughout its football history, the stadium was usually a home ground for FK Sarajevo's and FK Zeljeznicar's international matches. Sarajevo audience witnessed many great matches against Europe's finest clubs such as Manchester United, Dynamo Kyiv, Derby County, FC Basel, Hamburger SV, Newcastle United etc. The stadium's largest attendance was recorded in 1981–82 league match between FK Sarajevo and FK Željezničar. Allegedly, up to 60,000 people attended the game, though exact number was never officially published. On 7 February 1984, Asim Ferhatović Hase stadium hosted the opening ceremonies of the 1984 Winter Olympics for which it was thoroughly renovated and expanded. About 50,000 people attended the ceremonies. The west stand held 18,500 seating places at that time. Pope Francis celebrating a mass at the stadium in June 2015. ^ a b "Sportski objekti i plohe u Centru". Centar.ba (in Bosnian and English). Municipality Center, Sarajevo. Retrieved 4 November 2018. ^ 1984 Winter Olympics official report. pp. 10-14, 90. Wikimedia Commons has media related to Asim Ferhatović Hase Stadium. This page was last edited on 10 February 2019, at 20:06 (UTC).